When people are asking me for my number one experience from South America, I have little hesitation in saying ‘Galapagos’. Even though the place was way more touristy than I had envisioned (same could be said about all of South America, really) the waters, animals and volcanoes made it so different from anything else in my trip. 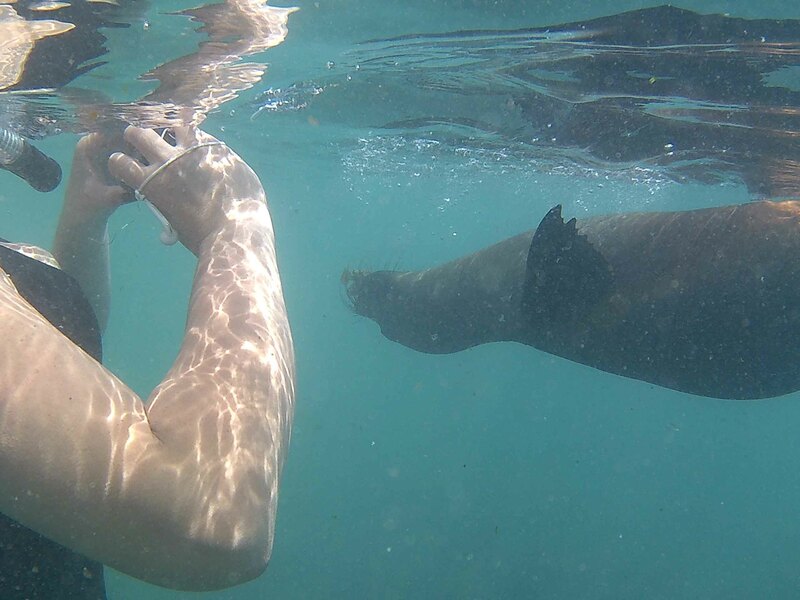 Speaking of animals, perhaps my best experience was swimming with the sea-lions. 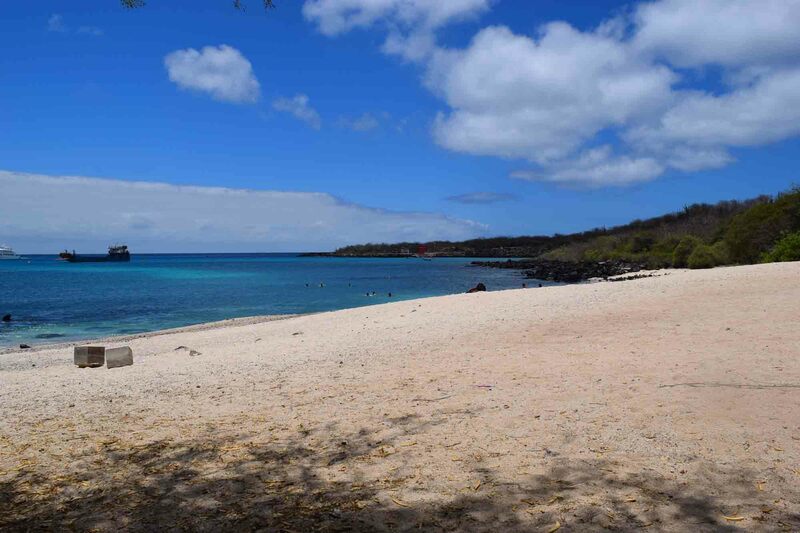 I was on San Cristobel Island, the last full day in Galapagos, and some of us on the tour had decided we wanted to do something on our own rather than follow the cracking of the tour guide whip. Activities were optional on that day anyways and around half the group if not more decided to do their own thing. We were advised that there was some decent snorkelling at the Punta Carola. So four of us went around there after organising snorkelling gear and I was ready for my second ever snorkel! We were also advised that we’d need wetsuits as the water would be too cold, but it turned out to be fine (we didn’t take the suits anyways) and I soon discovered that the flippers were surplus to requirements too and just got in the way. 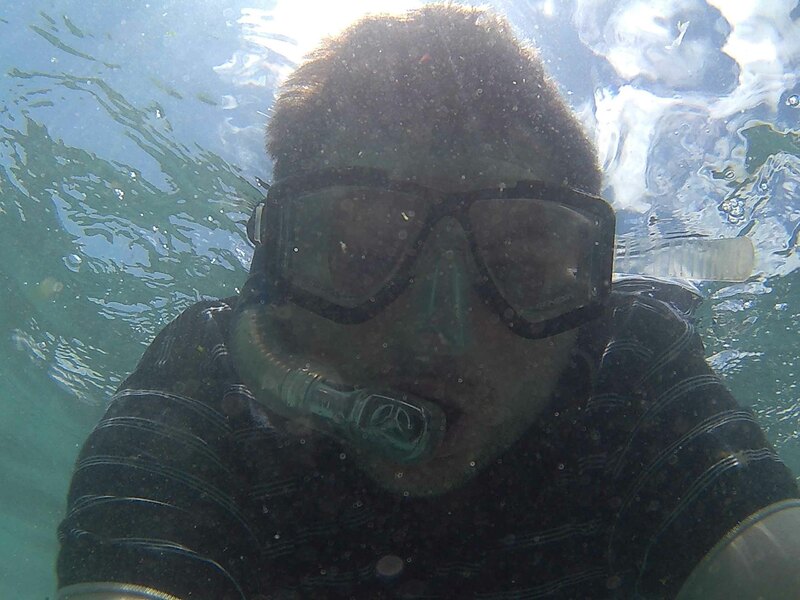 My GoPro Imitation (Kaiser Baas) camera had given me terrible grief the previous time when I went snorkelling when just as I was about to jump into the water the message ‘Card Error’ flashed onto the screen. I wasn’t really sure how it was going to go second time around with a new memory card, but it ended up working fine. As I was able to go in and out of the water I could check it was working okay as the screen was mighty hard to see in the water. Here be the beach in question! 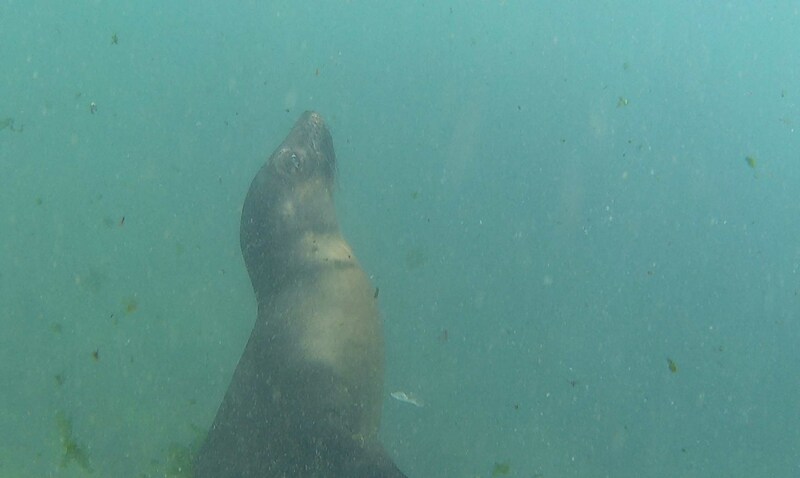 The Sea-lion dives to grab some tasty seaweed. I exited the water to see what my camera was doing. More sea lions arrived. I went back in and one swam up to me and the two others in the water. It swam in and around us, it seemed to be playing with us. 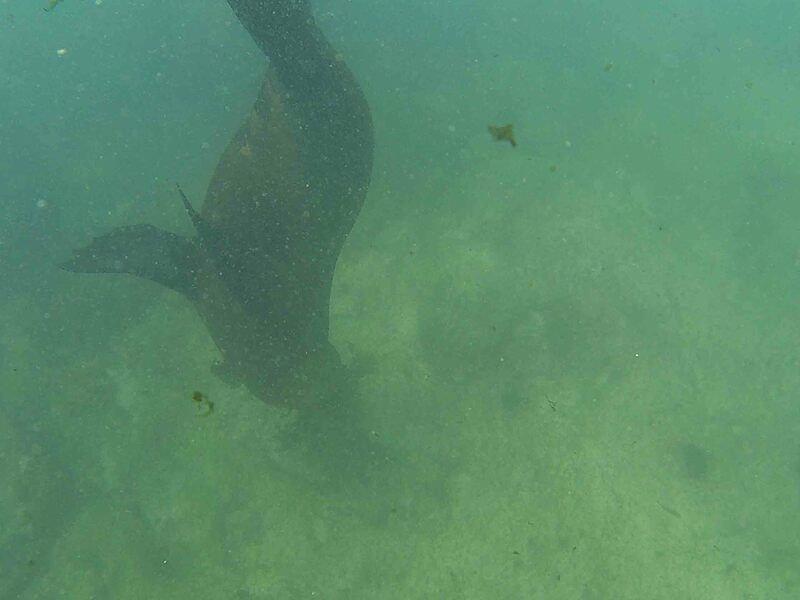 It ducked down to the bottom and came back with seaweed in its mouth – it must have been lunch time! 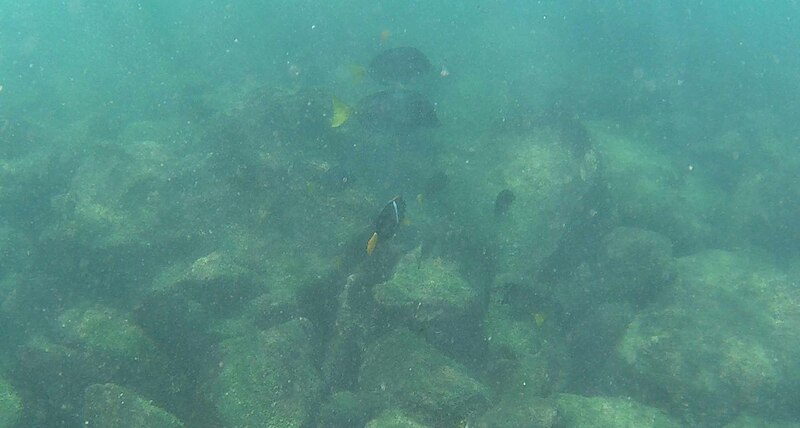 I swam out further and I found some beautiful schools of fish. I was able to get some good video of what I saw – that will be coming in the next week or two. Later more sea lions came along and there was a furry baby one on the beach and a couple of others, including what we were warned was the ‘alpha male’. The male that considers himself to be head honcho sticking his chest out and hooting at the top of his lungs. The alpha male gets all… big? Actually, they can be quite intimidating. We were told by our guide that he is very possessive about the females and young ones. 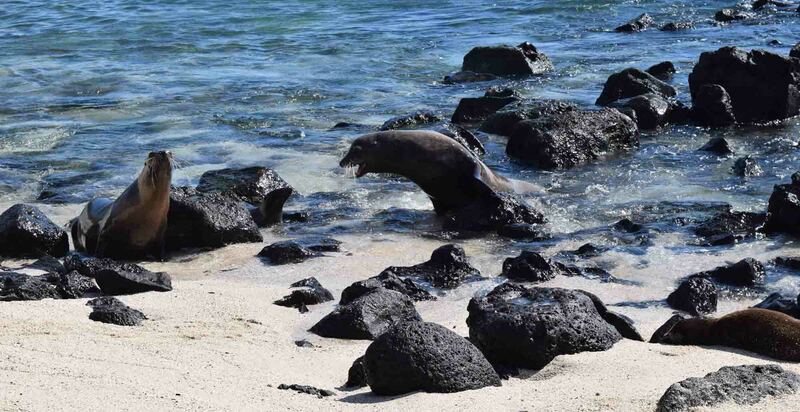 We’d seen on the first night on San Cristobel a confrontation between one older male and an alpha male, and the alpha male had scared him off good and proper. Anyway, the one on the beach and in and out of the water was very territorial marching up and down making a strange ‘honking’ sound. Luckily the beach was just long enough to keep away from this insecure fella. On the far side of the beach, a little later on, a baby seal and a few others came up and took in some sun. They made for good pictures – they looked simply adorable! I stayed at the beach to try and dry out my shirt – YES I was sunsmart! In fact Galapagos has some of the worst UV in the world, far worse than Australia which we’re always told is lethal. Finally, just in case people are wondering, the difference between seals and sea-lions. 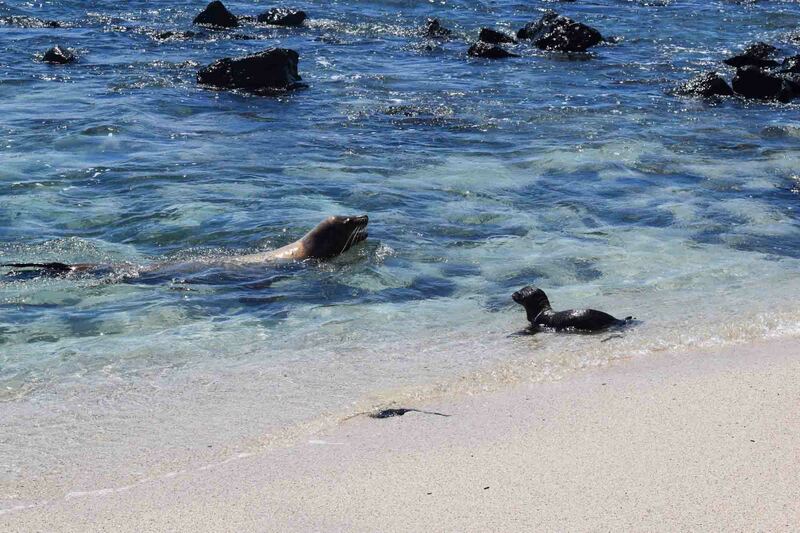 I was told reliably on the tour of Galapagos, sea-lions have protruding ears. So, if you are wondering right now, I hope that your question is answered! Thanks for reading, and May the Journey Never End! I bet they are. You have lived to tell the tale! did I? Oh, yes I guess I must have done! 🙂 well, you know more about being under water than I! It’s really very special! Do it! Ok so THIS, my friend, is truly awesome!!! 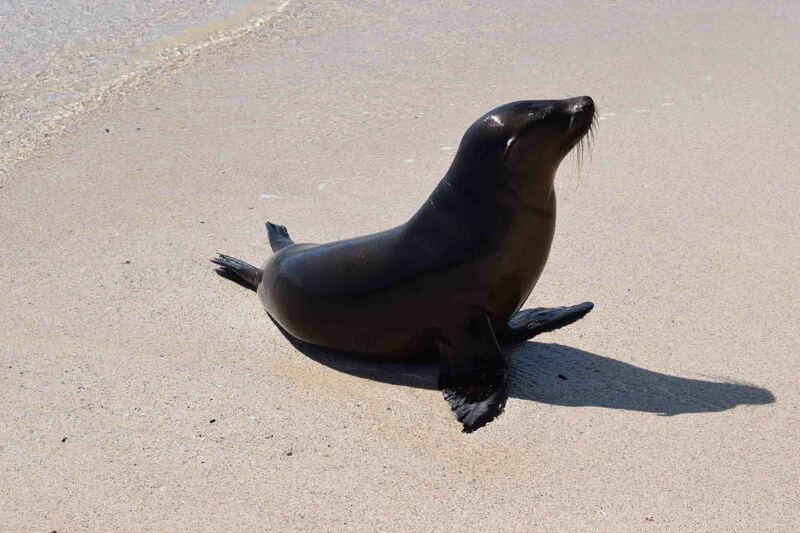 Always love sea lions (well, except for their smell – it can be pretty bad). But always enjoy seeing how they interact with each other.